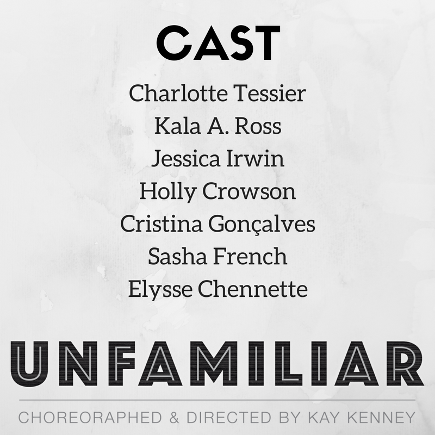 UNFAMILIAR will open with a performance by choreographer/director; Kay Kenney showing a remount of 6/26/80, inspired from a detailed journal given to her by her grandmother, written during her first 80 days of being 80 years old. This is followed by UNFAMILIAR, a new full length creation set on 7 women. The work was generated and inspired by the definition of the word UNFAMILIAR: unrecognized and surrendering to a sincere unknowingness. The performers harness a constant awareness for the present, using a choreographic language to allow their control to slip away to discover new layers of selfthrough movement, story and song. The dancers work with memories as triggers to channel specific moments in time. For example: a lullaby that reminds you of your childhood. Taking a nostalgic journey of distraction and unity, the performers will leave the audience in a dream-like fantasy world.